Situated in the forest area around Harads, Sweden, Treehotel has now implemented five of the 24 rooms it has planned for the area. Among those are “The Blue Cone,” “The UFO” and “The Bird’s Nest,” all suspended four to six meters above the ground and designed in eco-minded fashion by some of Scandinavia’s leading architects. Designed to blend into its surroundings so as not to ruin the view, the Mirrorcube is an addition to this collection, featuring mirrored walls that reflect their surroundings and yet are safe for passing birds thanks to a layer of infrared film. Featuring six windows and a panoramic view, the Mirrorcube accommodates two people with a double bed, bathroom, lounge, and rooftop terrace. Perhaps most interestingly of all, the Mirrorcube is now for sale, with a delivery time of roughly four months. Retail pricing is reportedly about EUR 275,000 excluding transportation costs. Because of the cube’s ability to blend into its surroundings so well, it may be a perfect choice for those looking to create accommodation in areas of natural beauty. Treehotel is currently looking for suitable resellers for its Mirrorcube. via Swedish hotel’s nearly invisible glass ‘tree rooms’ | Springwise. Accor, the world’s largest hotel group and operator of brands such as Ibis, Novotel and Sofitel, said it had launched the online platform to make information on sustainability, including, research, surveys and case studies of good practice, available to any operator, whatever their size, for free. The move coincides with the completion of a major piece of new independent research by Ifop on behalf of Accor that shows the vast majority of hotel guests are concerned by sustainable development. Accor’s executive vice president for sustainable development, Sophie Flak, said the findings confirmed there could be no more excuses for hotels not taking action on environmental, social and economic development. The survey of 7,000 Accor guests across six countries, including the UK, France, Germany, Australia, Brazil and China, found that eight out of 10 hotel guests felt sustainable development was important to them. It also revealed that guests had high expectations for hotels to take action across four key areas: water, energy, waste and child protection. But Flak said one of the most important findings of the survey was that a majority of guests now expect a hotel that implements sustainable policies to be a comfortable one to stay in. Accor, which operates 4200 properties across 15 brands in 90 countries and employs 145,000 staff, launched its own five-year sustainability programme, Earth Guest, in 2006. The programme, however, has only been partially successful in meeting its objectives. Accor set itself a target to reduce its energy by by 10 per cent between 2006 and 2010 but missed it by 4.5 per cent, while it only reduced paper waste by 53 per cent against a 70 per cent target. But it exceeded its target on water, cutting it by 12 per cent against a target of 10 per cent. It has yet to set targets on carbon emissions, said Flak, but will be doing so in a new environmental strategy the company will be announcing in early 2012. The release of the data, early next year, will coincide with the planned launch by the £3.7 billion international tourism industry of common standards to calculate and report on the carbon emissions of the sector. Accor said findings of its latest research were now available on its open platform, Earth Guest Research. It wants other hotels to use it to adopt sustainable policies and said it plans to release several pieces of new research a year. In return, it is calling on other hotels to share their research and methodology so the whole industry can benefit. In September, the UN World Tourism Organisation launched an online toolkit to help hotels evaluate energy consumption, find renewable sources and cut their cost through improved efficiency. via accor news | Accor creates open platform to share knowledge on hotel sustainability. 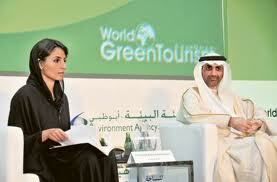 Posting directly from Abu Dhabi, where I have been invited by our worldwide ambassador, the Green Sheikh, and our supporter Goumbook, in the person of Mrs. Tatiana Antonelli Abella, to attend to the World Green Tourism event, supporting them during the opening day which took place last Monday, Dec. 5th. The morning conference was opened by the introduction of HE Razan Khalifa Al Mubarak, Secretary General Environment Agency – Abu Dhabi (EAD) who actively supports responsibility and sustainability actions in Abu Dhabi and UAE respectful of the local environment and wildlife. Immediately after our worldwide Ambassador HH Abdul Aziz bin Ali Al Nuaimi, aka the Green Sheikh, captured the audience with an engaging presentation, merging his life philosophy and his belief together with his support for the environment and with his many travel experiences and encounters with people of all races, cultures and social classes. From Antarctica to Brazil, Iceland and Australia via amusing anecdotes, the Green Sheikh skillfully showed the audience that we are all equal, no matter if men or women, adults or children, Christians or Muslims or Jews or following other religions, rich or poor. To my great surprise – and I want to publicly thank the Green Sheikh for this- the Green Sheikh introduced the ECOFFEE platform to the audience, presenting it as a great opportunity for young entrepreneurs. ECOFFEE as a “Sustainable entrepreneurship platform” was in fact coined together with the Green Sheikh during our first meeting some of months ago, while talking about ECOFFEE’ services and projects, like the Franchising coffee shop, especially designed for those entrepreneurs who want to run a profitable, responsible and ethical business. What I am witnessing here at the WGT event is the growing importance of the environment, sustainability and responsibility issues which are now actually transferred into daily business practices even in the Tourism industry – I am glad and proud to be among those who are actively supporting it each and every day with DESITA and ECOFFEE’s business practices. Global hospitality company Hilton Worldwide says it saved more than $74 million in 2010 across its portfolio of 10 hotel brands as a result of its sustainability measurement program, called LightStay. LightStay measures multiple utility and operational metrics such as energy, water, carbon, housekeeping, paper product usage, waste, chemical storage, air quality and transportation. In addition, LightStay features a “meeting impact calculator” element that calculates the sustainability impact of any meeting or conference held at a property. Hilton recently added new features to LightStay that allow hotels to track projects, share best practices and communicate with one another through a social network dashboard. Thus far, LightStay has more than 1,200 projects in the system, which is expected to double by next year, as all of Hilton’s more than 3,750 properties are required to begin using LightStay by this December. “LightStay has provided us with a platform to measure hotel performance and economic improvement, proving to be invaluable given today’s increased operational demands and resource constraints,” says Christopher J. Nassetta, president and CEO of Hilton Worldwide. Over the next three years, Hilton says it will continue to invest in their owned assets to improve building performance. Projects will include the installation of energy-efficient chillers, boilers, motors, building automation systems, water reclamation systems, high-efficient windows and white roofs. The Hilton New York, for example, will be installing an onsite cogeneration system, which will offset 54 percent of its electrical needs and 33 percent of its thermal needs. Hilton recently earned ISO 14001 certification for Environmental Management Systems, achieving one of the largest ever volume certifications of commercial buildings. via Branded Sustainability Measurement System Save Hilton $74 Million | Sustainable Life Media. Establishing key performance indicators that enhance the environmental and social impact of the hotel industry while continuing to provide the highest levels of quality and service for hotel guests. With nearly 51,000 lodging properties in the United States alone, and billions of dollars spent in FF&E purchasing annually, the hospitality industry has an important role to play in its path toward greater sustainability. Industry leaders recognize that reducing their environmental footprint can only be accomplished through the combination of sustainable buildings, operations and greening the supply chain. The goal of the Consortium is to provide the industry with a unified approach to greening the global supply chain through customization of an industrywide purchasing index (HSPI) that measures and reports on the sustainability performance of suppliers. Beginning with FF&E, the HSPI will set the standard for sustainable purchasing and create a repository of supplier performance, including corporate social responsibility, product, and environmental sustainability. Consortium founding members include Marriott International, Audit Logistics, Benjamin West, Delta Faucet Company, Innvision, InterfaceFLOR, PE INTERNATIONAL Inc., RTKL, SERA Architects, and Valley Forge Fabrics.